If we didn't have books, then we couldn't go into so many fantasy worlds. Movies provide these worlds as well, but not nearly as good or as in depth as books. 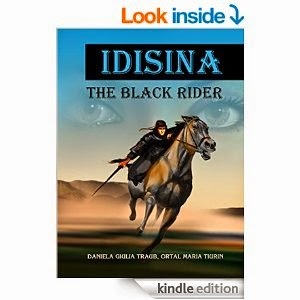 Idisina is a great fantasy novel. It really depicts some amazing scenes and places. Daniel, is the main character, and he sets out on the adventure of a lifetime. He keeps growing and learning along the way, right along with the reader of the book. There is so much magic and adventure in this book, it will leave you on the edge of your seat. This book may say it is for YA, but it is written so well, that adults will like this book as well. Like all books, sometimes it takes a little while for the book to get into a groove. The first chapter of this book goes really slow and you might be tempted to skip ahead to the next chapter or to skim the first chapter. But just stick with it, you learn some things in the first chapter you need to know. After the first chapter though, it gets so much better. Once the book starts going, you really get pulled in. Once you find out more about Daniel, you won't be able to put the book down. The other characters are easy to fall in love with as well. Reading this really gets you into the middle of a story about the battle of sexes. There is always a power struggle in life, whether it is in real life or in a book fantasy world. Daniela Giulia Traub, has an amazing talent, of showing how much emotion there is in this book. Most authors don't know how to convey emotions, but she is amazing at it. My heart was torn in many parts of this book. When they were feeling something, so was I.
I know if my grandmother died, I would have all the same emotions as him. It's horrible that he has to leave the city, but if he didn't, we wouldn't meet all the amazing characters that are in this book. He really loved his grandma and you can see how much the pain of the loss really drives him to become the person he becomes by the end of the book. I really like this book. It is easy to read and a fun read as well. It says YA but I think adults can get into it as well like I said earlier. You can get it on Amazon, just click here and get it. For only 99 cents, you can get this book and it is worth it. You can also find out what other people are saying about the book and find out more about the book. I received this for free in exchange for my honest opinion.